Sorccia Stone panels are made up of a front layer of thinly cut real stone adhered to unique backings that are engineered to create an extremely strong and light-weight stone faced structure that is up to 10 times stronger than ordinary slab stone. Using advanced technology, stone panels from Sorccia’s manufacturing facility are cut as thin as 3 mm, drastically reducing the amount of stone used. The stone panels are then laminated to different backing materials allowing for use in a wide range of applications, many of which are not suitable for traditional solid stone. 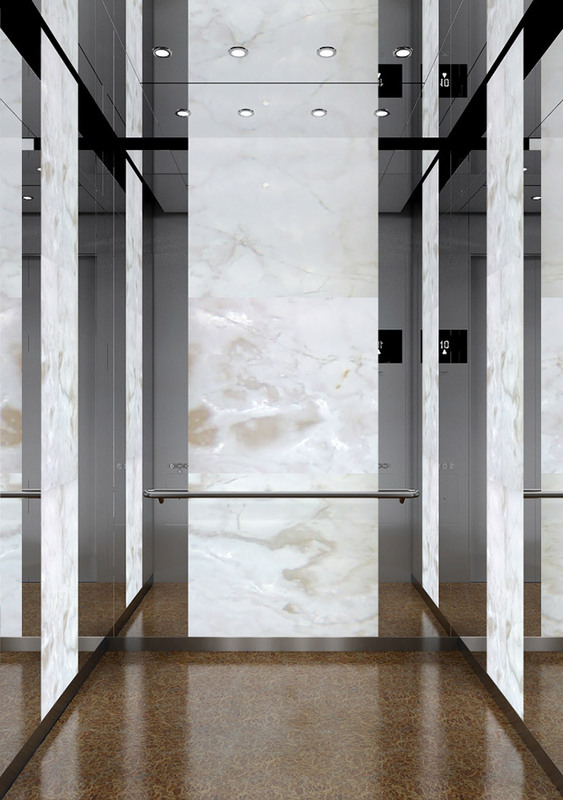 Thin stone panels maintain all of the beauty, feel and attributes of natural stone, and the reduced weight allows for easier and faster installation. Each panel consists of 100% natural stone. The stone is quarried from around the world and has an abundance of appearances and distinctive characteristics. 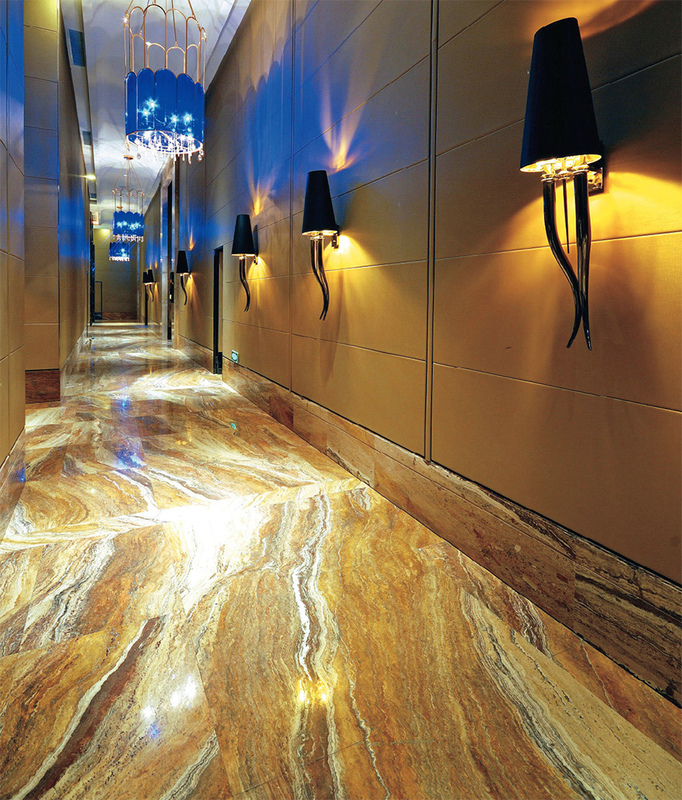 Panels are available in many colors of marble, travertine, onyx, agate, granite and semi-precious stones. 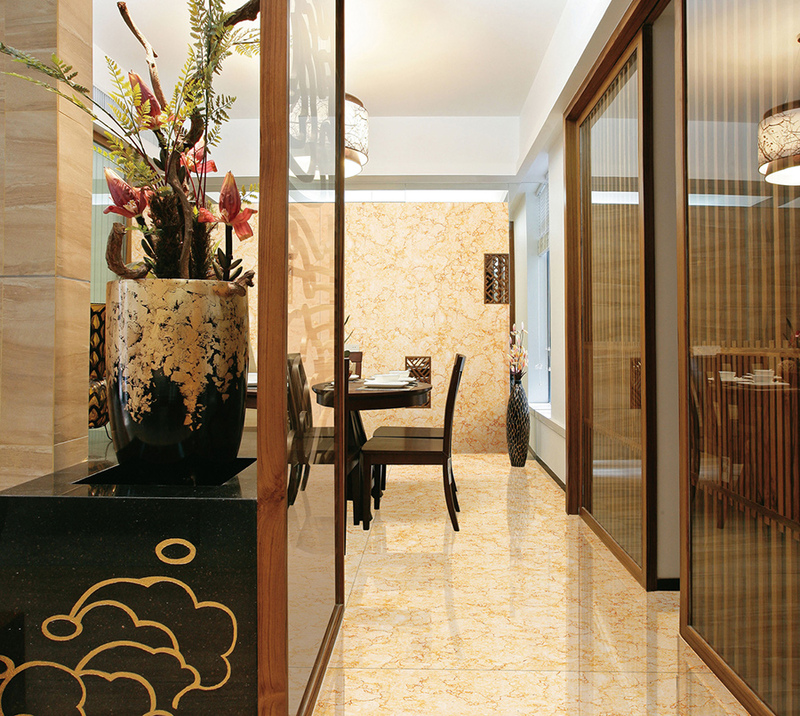 Once installed, Sorccia stone panels are indistinguishable from solid stone. 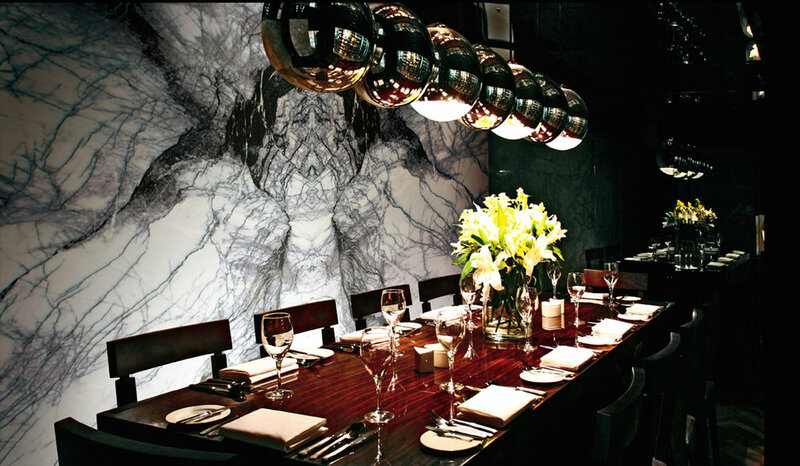 Sorccia stone panels have been used for many projects in the USA such as the Las Vegas Bellagio Casino and Hotel, University of Michigan, the Reilly office building in New York, New York Hilton Club, Sheraton Hotel, Crown Plaza, Mormon Temple, and British Alberon Square. Sorccia Stone is based in Los Angeles, California but the panels can be shipped world-wide. Sorccia Stone panels are suitable for a wide range of applications, not just for their unique aesthetic but also their high strength, light weight and low installation costs. Common application uses include exterior walls, bath and shower panels, wainscoting, feature walls, tables, flooring, ceilings and fireplace surrounds. By using Sorccia Stone Panels in the design process, contractors and builders are able to save time and money on labor, all while using a product that is modern, aesthetically beautiful and easy to maintain and sanitize. NATURAL STONE – Each panel consists of 100% natural stone. LIGHTWEIGHT – Sorccia panels are 1/3 to 1/6 the weight of traditional stone materials. ULTRA-THIN – Using advanced technology, stone panels from Sorccia’s manufacturing facility are cut as thin as 3 mm, drastically reducing the amount of stone used. EASE OF INSTALLATION – Sorccia’s stone panels are lightweight, making them safer and easier to handle, and can be easily cut or re-trimmed on the job site. Grout-less. 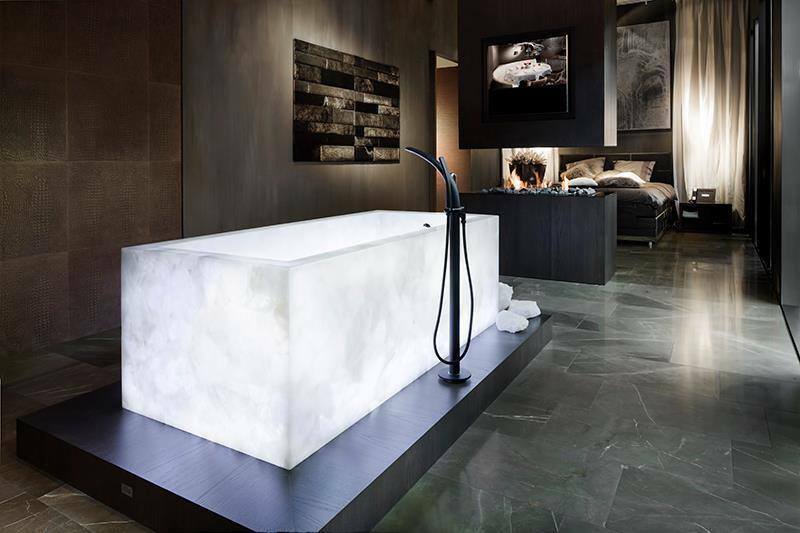 BACK LIGHTING - The thinness of Sorccia Stone panels makes it ideal for your backlighting projects using translucent stones like onyx, agate, and certain marbles. ECO-FRIENDLY – Thinner panels also mean less environmental impact in terms of raw material usage and energy consumption. Transportation costs are lower per unit, and manufacturing thin panels produces fewer emissions.